Medieval church highly restored in the late C19th. The arcades date from c.1300, transepts early C14th. It has a perpendicular nave roof. Large parish church, medieval in plan and in much of interior, externally Victorian following a restoration and rebuilding (chancel, 1862; west tower and thorough restoration, 1870). West tower, nave with two aisles and clerestory, transepts and chancel. Pink random granite rubble with white sandstone dressings, south porch and clerestory faced in sandstone. West tower has two principal stages, buttressed and capped by thin corner pinnacles above a decorative frieze. 2-light openings to bell-chamber with heavy tracery. Large clock on south face below. Large south porch with embattled parapet and heavy gargoyles. Church parapetted throughout and buttressed - the buttresses also have white stone dressings and copings to gabled and trefoiled tops. Various types of window tracery: clerestory is Perpendicular; aisle windows a late Decorated style with reticulated curves. All windows have hood moulds terminating in large and massy foliate corbels. Chancel has a different and distinctive decorative scheme: buttresses have small projecting grotesque carvings, decorative frieze (foliage, beasts, etc.) below parapet and a later Decorated window tracery pattern, with spare tracery lines. Interior has nave arcade of 4 bays, with double chamfered arches on round piers, late C13. Easternmost piers have four shafts and relate to C14 building of transepts (existing transepts are C19). Perpendicular clerestory and nave roof - low-pitched cambered trusses with traceried panels, supported on angel brackets and with gilded bosses. Large chancel has fine carved choir stalls (1918), turned C17 altar rails, and an ornate stone reredos, representing the Last Supper, heavily undercut, also sedilia, 1884. Chancel roof a plain timber, low-pitched structure, with decorated cambered trusses and cornice. East window, a memorial to various C17 local figures, is by Powell and Co., 1890. So is the stained glass window in the south aisle, c.1929. Chancel contains memorial to Theophilus Cave, d.1656, in mannerist style with well-turned epigram. In south transept, a memorial to Martha Utber, 1745, a kneeling female figure at a prie-dieu in a surround with pilasters, broken pediment and arms. 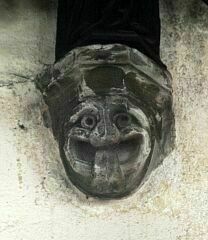 Project Gargoyle survey work in 2010 noted one rather splendid tongue-poking grotesque corbel on chancel arch. 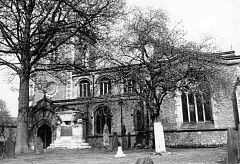 <1> Pevsner N, 1984, The Buildings of England Leicestershire and Rutland, p91-92 (Bibliographic reference). SLE4. Who conquers death and buries his own Grave." 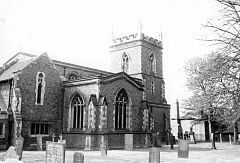 <2> Higgins, Tim, 2011, An archaeological watching brief at Holy Trinity Church, Church Street, Barrow upon Soar (Unpublished document). SLE4379. A watching brief was carried out on work to build an extension to the north of the church in 2011. The foundations of the north aisle and north transept were revealed, both of which had been underpinned with modern concrete, probably dating to the C19th refurbishment of the church. No articulated burials were recorded. <3> Morris, Mathew, 2011, Holy Trinity Church, Church Street, Barrow upon Soar: Historic building inspection and recording (Unpublished document). SLE3770. Inspection and recording in 2011 watched the removal of plaster from walls in the church were two new openings were proposed. In both the north aisle and the north transept the walls were faced with modern brick and concrete render, probably dating to the C19th restoration of the church. <1> Bibliographic reference: Pevsner N. 1984. The Buildings of England Leicestershire and Rutland. p91-92. <2> Unpublished document: Higgins, Tim. 2011. 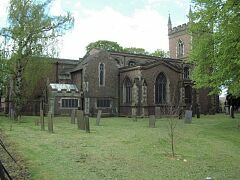 An archaeological watching brief at Holy Trinity Church, Church Street, Barrow upon Soar. <3> Unpublished document: Morris, Mathew. 2011. 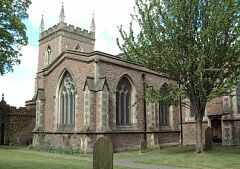 Holy Trinity Church, Church Street, Barrow upon Soar: Historic building inspection and recording.